With his white beard and big belly, Richard Sears, or Uncle Hanzi (meaning Chinese characters) as he is known in China, certainly doesn't look like the typical Internet celebrity in China. Yet five years ago he became famous overnight on Chinese social media after a Chinese blogger wrote a post about Sears' Chinese etymology website. Amazed with his two decades of effort researching Chinese characters, Chinese netizens gave him the nickname Hanzi Shushu. A former programmer, Sears has been attempting to break down every known Chinese character through a computing algorithm based on over 96,000 ancient characters that he has scanned into his self-run chineseetymology.org from ancient classics such as the Eastern Han Dynasty (25-220) dictionary Shuowen Jiezi and characters inscribed on ancient Chinese bronzes. 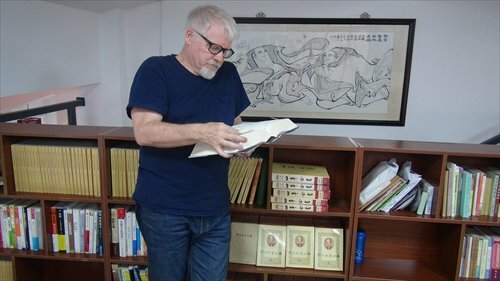 While many Chinese were stunned by what the 60-year-old foreigner had achieved, some wondered what experts thought of his work. "Academically speaking, chineseetymology.org is not very professional as its arrangement of Chinese characters is in disorder and therefore fails to present a timeline for a character's development," the International Herald Leader quoted Guo Yongbing, a professor from the Research Center of Excavated Documents and Ancient Chinese Characters at Fudan University, as saying after links to chineseetymology.org were posted on the center's website. "And there are many errors in ancient classics that Richard Sears uses as references." Despite experts viewing Sears' work as having "little academic value," he is still seen by many as a voice from the grass roots, especially after he won the Light of China Award along with Russian and Japanese sinologists in 2015. The award is presented annually by the Ministry of Culture and China Central Television to people who have made outstanding contributions in promoting Chinese culture. Currently, Sears is working on a Chinese etymology database that "is unlike any Chinese database you've ever seen." Born in 1950 in Oregon, Sears earned his bachelor's degree in physics and a master's degree in computing. He later traveled to Taiwan in the 1970s. He started learning Chinese in the early 1990s and later established his website in 2003. For a time he struggled to support the site, but, fortunately, after he rose to Internet fame in 2011 he began receiving contributions, mainly from individuals, to support the site. In 2013, a foundation called the Chinese Dream offered him a research grant worth 700,000 yuan ($104,000), but things haven't worked out just yet. "So far I haven't received a cent [from the foundation]," Richard told the Global Times in an interview in late July. According to Sears he is approaching Chinese characters in a new way with his research. "I study the cognitive psychology of character recognition. Chinese have not analyzed Chinese characters in this way," he explained. "Chinese experts, some of them are very traditional and do not think outside the box," he said. "Some of them think outside the box, but in different directions. But that's okay." According to Sears, many experts in the Chinese language are actually foreigners. "The reason is Chinese [language] for Chinese is just a tool. So they're not really interested in the language," he explained. "But for foreigners it is a difficult process. So we want to understand why." When it comes to criticism about his website, he admitted there is room for improvement. "In the past I just posted pictures of the characters on my site and made no analysis. But now I'm trying to figure out how these characters were formed." "I want to stay in China to learn more about Chinese characters," Sears has been quoted as saying in numerous interviews. Not everyone has been supportive of his passion for characters. Sears has remained single after his second wife left him 20 years ago because she thought his Chinese character studies were just "a waste of money." "Maybe I am not cut out for marriage," he said. Since moving to China three years ago, life hasn't been easy. Finding a permanent job has been particularly difficult. He recently worked for a company in Shanghai that produces educational material, before that he spent three years working as a physics professor at Beijing Normal University. "But I have no regrets choosing the life I'm living now," Sears told the Global Times. "One should not just do what other people tell you to do. You need to find your own interests and pursue it even if it doesn't make you rich." Currently he wants to go back to teaching. However, it is extremely hard for him to land a job at a Chinese college, "because I'm not a PhD and I'm now 66," he said. Although he is getting on in years, Sears isn't letting his age keep him from his research. "Normally when he feels too tired to work, he will sleep for two to three hours. Then he wakes up and continues working," said Zhang Lei, his Chinese assistant in Shanghai. "I feel like I'm 25!" he laughed when asked if his schedule has impacted his health. On Saturday morning, after another failed attempt to obtain a work visa in Shanghai, Sears boarded on a flight back to the US. Since his degrees were not the right fit for the education company he was working with, he failed to successfully receive the R Visa for foreign experts. "But there is good chance that Tsinghua University may offer Richard a job, but everything is still under discussion. Hopefully that can help settle his visa issue," Zhang told the Global Times on Saturday.